Since version 1.6, Portable Document Format (PDF) introduced interactive 3D geometry objects within the file structure. 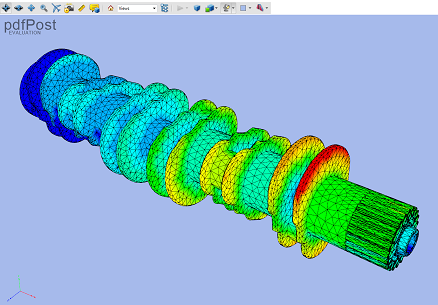 pdfPost is Finite Element Data Base converter, which allows a user to share FEA results using PDF files. 3D models with FEA results can be easily exported and presented to other parties involved in the design/calculation process. There is no need for additional FEA licenses or even FEA software compatibility. Sharing FEA results has never been so easy. If you’re interested in our software please go here for the full list of features. Beta version of pdfPost has already been used in some big calculation projects. For details click here. 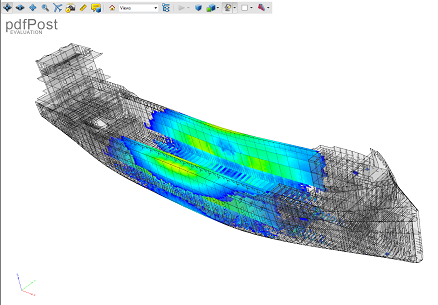 Finite element analysis results are often shown as color plots. 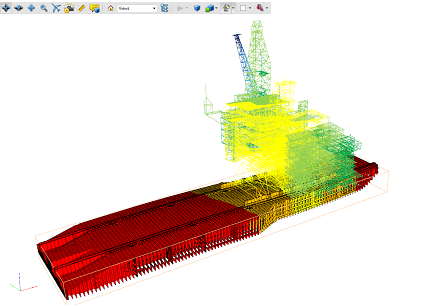 With complex models, analysts are forced to generate large amount of images to show important areas of construction. Using 3D PDF enables to improve communication significantly, along with the design flow and solution finding during the design process. Each calculation process involves reporting. Although it often appears to be procedural and repetitive, it remains an important part of the job. Putting equations and conclusions on paper is one thing, but preparing images and formatting, is usually time consuming and not interesting at all. 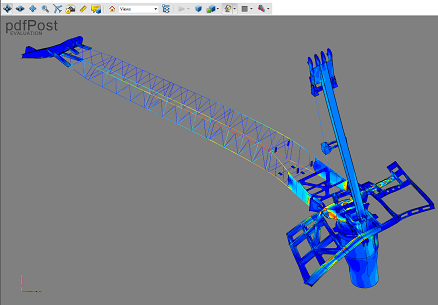 However, with use of 3D PDF, an engineer can focus on the most important aspects of the report. With use of 3D PDF, communication with the client can be fast, easy, and most importantly, precise and reliable. 3D plots are enabling parties to exchange data often and in full. Incremental nature of PDF allows users to put comments directly on 3D geometry. At the same time it makes the cooperation very contextual. It is important to collect the information from more experienced users. They might not be available at all times or they might use a different software. With 3D PDF it doesn’t matter. The question can be asked within the model and answered in the same manner. With 3D PDF it is possible to share your knowledge with others. Whenever it is a conference, a client, a presentation or training. Big projects such as ships, offshore rigs and cranes require an approval by a classification society. Calculation reports have to be delivered to the class. 3D PDF allows classification society to have full insight in these reports. Comments, questions, and remarks can be added to the geometry for better understanding. Classifications societies are interactively commenting PDF drawings already, and the same procedure can be applied to the calculation reports.